When you got the hang of trading, you can increase the points you make per trip dramatically, with a few extra steps. Example if you have four, 20 cargo upgrade Spanish Galleons and a total cargo room of 1368 and your low price city got buy food at 5 and the city with lack got buy price 25 and sell price 18, then you have a cargo price of 5, as that what you bought the food for. You can see your cargo price by using the right click menu and press fleet then cargo. Then first you just sell 500 of your food to gain 25 trade points and buy it back, now you will have a cargo price of 9,2. Then you sell another 500 food to gain 25 trade points and buy it back, this will increase the cargo price to 11,7. Then you again can sell 500 food to gain 25 trade points and buy it back to get a cargo price of 14,3. But at the city with lack, the sell price is 18, so you do one more time, with selling just 500 food to gain 25 trade points and buy it back. Now your cargo price will be 16,8, this is very close to the cities sell price, which is 18, so now you sell all 1368 and gain 68 point. So total you gained 25 points 4 times and 68 points one time, so total of 168 points before you have to sail back to the low price city. Note that the buy and sell prices at the city you gain skill points at, can vary a lot, so you always have to check cargo price, to find out how many times you can sell some and buy it back, before selling it all. 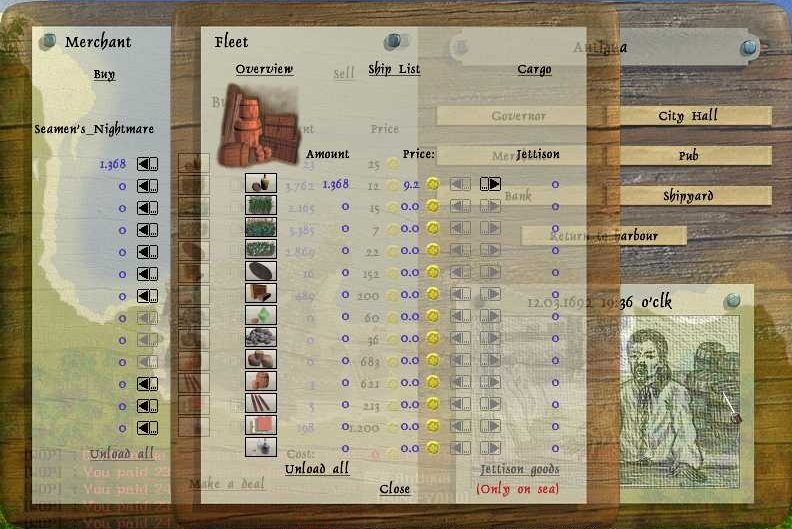 Also as you get more navigation and can have more ships in your fleet and more cargo rooms, you can increase the amount you sell and buy back, before selling it all. When you get into city prices and demands, you will see that not all goods you need a lack of, to be able to trade with them, especially tobacco and cotton is easy to make many trade points with, even without a lack.